Monotype Encaustic prints both luminous and beautiful. You will learn a variety of techniques to apply encaustic wax colors to a hot metal plate. The fun part is placing the paper over top to absorb the colors. Pulling the paper off is magical. Each print you create is unique... thus "mono" type printing. Each print you make leads to an idea for the next one. 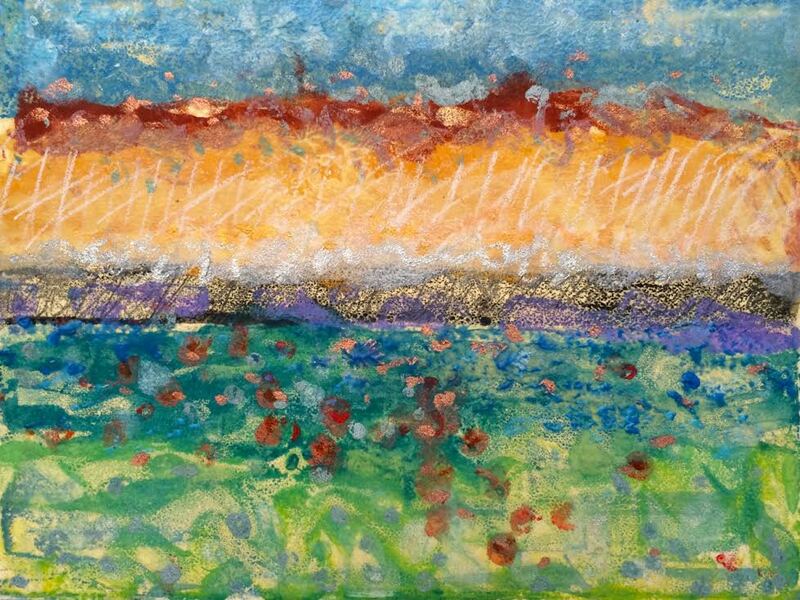 You will learn some encaustic basics, monoprinting techniques, mixed media techniques and all about various printmaking papers. The possibilities are endless! Level: Beginners and those with some encaustic or printmaking experience welcome. Remember, when you are a student at ARTspot, you receive 10% off art supplies purchases, from the time you are registered and paid through the duration of the class!  One or more art stencils. ARTspot carries a wide selection of TCW heat-resistant plastic stencils that work well with hot encaustics... or bring Bristol board, very thin cardboard or tag board to make your own), no larger that 8x8"
 For “mark-making”: oil pastels (Portfolio brand recommended*), metallic colors also nice, or some of the following water-soluble sticks: Woodies*, Derwent ArtBar, CretaColor Aquastics, Staedtler Karat*, Stabilo water soluble pencil and/or a 9B Lyra water soluble graphite crayon* or Sharpie china marker(s*).  One Enkaustikos printmaking plate, anodized aluminum, no larger than 8x8”* - you can wait until day of class to choose the printmaking plate that works best for you.